This evening The Mister, The Little Mister and I went for dinner at my friend Emma and Martin’s house. We had a lovely evening with them and their bonkers children and the we watched Strictly. They also have this gorgeous cat called Sam (well, to be precise, her parents’ do). 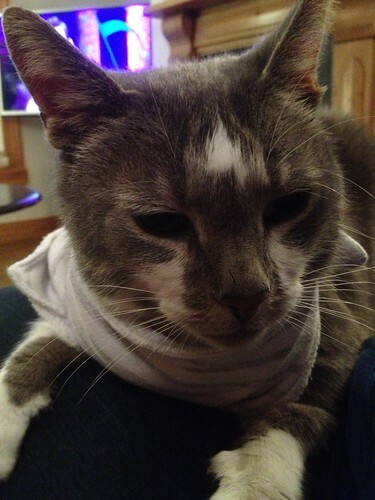 He is really docile and seemed to be quite content wearing The Little Mister’s bibs. I truly appreciate having Emma as a friend. We have known each other since we were little and we sit next to each other in choir, generally trying to work out what they hell is going on. She is fun and we regularly get up to mischief together! On a Friday I take The Little Mister to his swimming lesson. 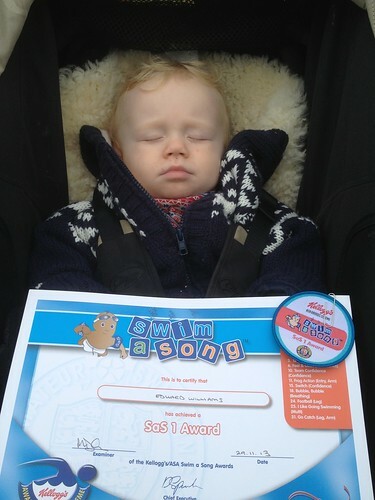 He absolutely loves it and today he got his first swimming certificate and badge. He celebrated by having a well-earned nap. Tonight The Little Mister and I went to a craft fayre as my cousin’s wife had a stall there. She runs a rather brilliant company called Bird & Bloom and I have been making bunting for her to sell at the craft fayres. I love the stuff that she sells, in particular the lovely personalised prints that she makes. They are gorgeous. 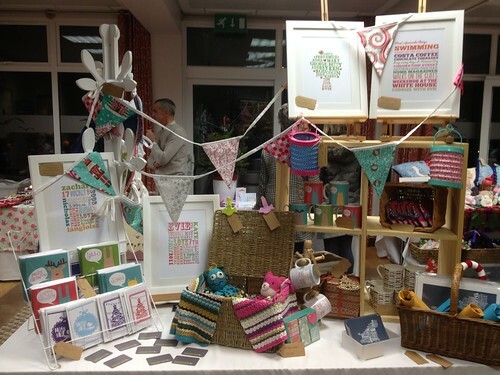 Her stall looked lovely so I hope that she manages to shift some goods, especially my bunting of course! On a Wednesday The Little Mister goes to his Auntie Louise for the day. He seems to really enjoy being there but I think it must be very tough for my sister having three of them, especially when Eden has a strop when Louise picks The Little Mister up! I am so grateful to all the people who have stepped up since Mum died to help us out. There are so many people who are helping and supporting us and I am very grateful. 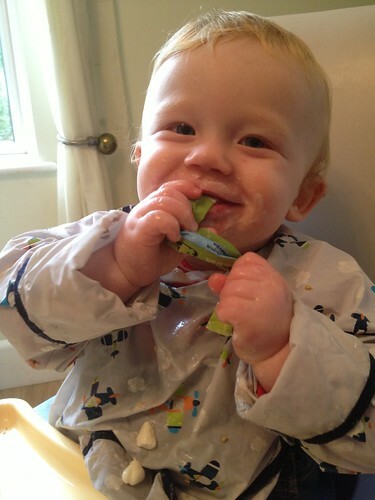 Today The Little Mister discovered another essential food group…. frozen yoghurt. Yum! Today I was working in town as I went to observe family court. It was really interesting to see how it works, and in particular it was fascinating to see how fast the judge made decisions about what would happen to each of the cases. I think she got through 16 cases in about 3 hours! 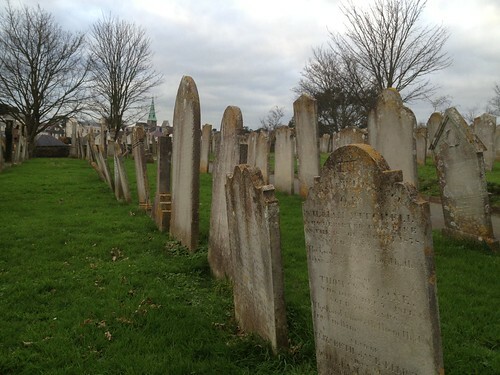 I took the car in for a service which meant I walked into town and walked past the cemetery. I have never been in it as it is set up above the footpath. I do like a nice graveyard, although it was rather grey and chilly today. 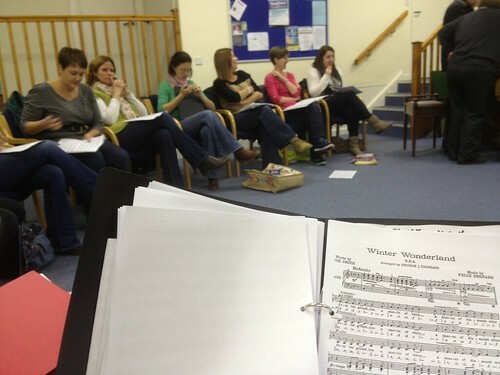 Without a doubt singing is good for the soul. It helps to manage stress, teaches you to breathe properly and it is a real stress-reliever. Not to mention that the girls are good fun and we always have a laugh. It is an absolute pleasure to be part of a community that is generous in the good times, and the bad times. Thanks girls! Today we went for lunch with my sister, her family and some of their friends. 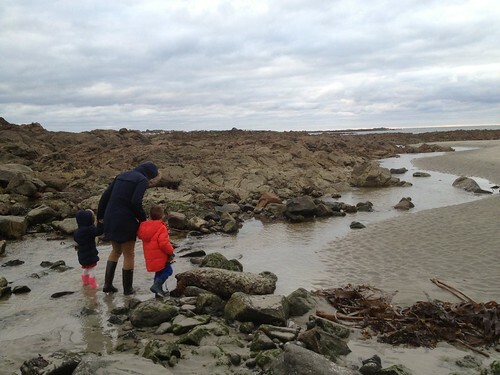 We had a really nice lunch and then went to a quick walk across Vazon Beach. It was cold, grey, blowy and freezing so it wasn’t a terribly long walk but it certainly blew a few cobwebs away! My Auntie Jen is an expert jam and chutney maker (not to mention she;s pretty good at cakes and other stuff too!) and today was her annual Christmas sale of hampers and other jams, chutneys and cakes. The Little Mister and I went down to catch up with the family, buy a few bits and pieces and sample some truly delicious mince pies! 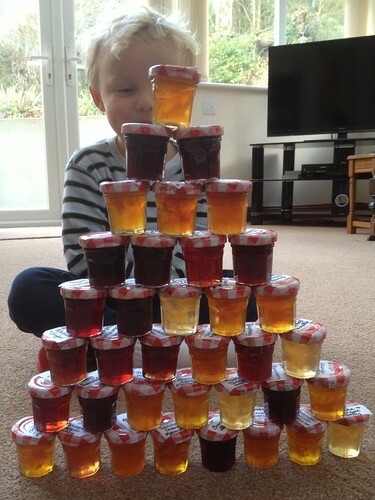 It made me laugh when I noticed that Auntie Jen’s grandson was building a tower out of all the mini pots of jam. They were such lovely jewel-like colours in the sunshine. No wonder he wanted to play with them! This afternoon I went to town with my sister and my niece and nephew to do a bit of Christmas shopping. The kids made me laugh, especially when we went into one of the shops and my niece told me, in no uncertain terms, that she wanted a particular pink fleecy jumper for Christmas. Her conviction that I would buy it for her really made me laugh. Of course I probably will! 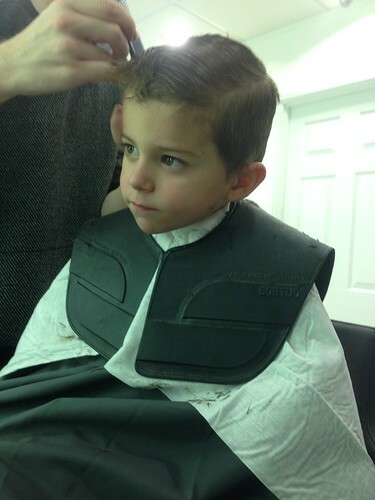 My sister also took them to have their hair cut. This is my nephew. He is so handsome and looks so grown-up here. Lovely boy. It’s starting getting chilly around here and I was really cold last night. 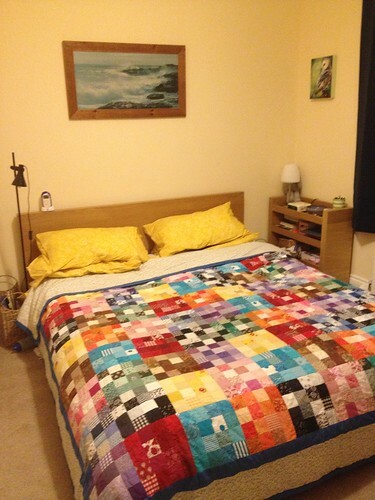 So, I rifled in the loft for my favourite patchwork quilt. I love having it on our bed. It is heavy which means that sleeping under it is lovely and it is so, so snuggly.